The design concept of putting the C register on the microcode store was the same I used on the Black Box at MIT, and it worked well. 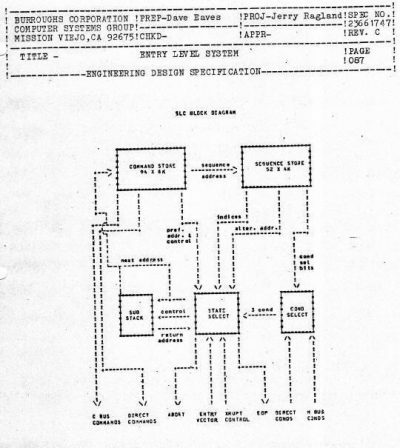 The MIT computer used ECL, which used a low voltage (.7v) swing and a terminated transmission line for signals longer than a couple of inches. With ECL noise was rarely a problem, even at very high speeds. The B5900 was designed with TTL, which had a very large voltage swing (3.7v) and no transmission line termination. To make matters worse, we used high speed drivers for the backplane which tended to make the noise problem worse. I needed a solution that would have minimum impact on the schedule. I brainstormed with the guys for a couple of days, but no one had a solution. That evening I thought about the problem, what if we move the C register to each of the cards that interface to the C bus. In the current design, the backplane must remain noise free for about 150ns of the 180ns clock cycle. If I move the register to the logic board, the C bus need only be stable for about 10ns, long enough to register it. I penciled out the design change, and it seemed to be a solution to our problem. But the B5900 circuit cards were pretty full of logic. Where would we get the room for the register? Turned out that the TTL logic family, which caused us this problem, would also present the solution. We used an eight-bit buffer chips to control the loading off the C bus. Each card that took commands from the bus had to buffer them first. Turned out the TTL logic family had an eight bit register in exactly the same pin configuration. 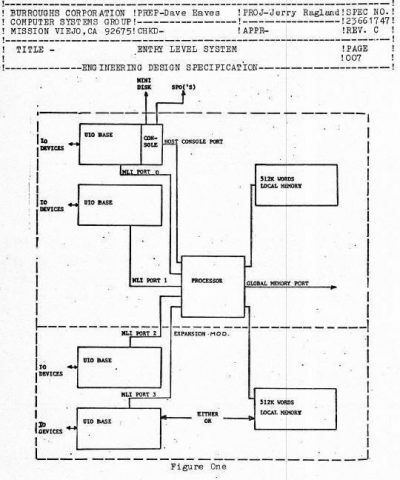 The register on the SLC would be replaced with a driver chip, and the buffer chips on the logic cards would be replaced with registers, which would also act as buffers and reduced the noise susceptibility window to a few nanoseconds. By that time the team was pretty downbeat, it looked like we were going to slog through a complete redesign. I presented my solution. Jerry and Dave suggested that we do a quick test on the existing prototype by pulling the existing chips and doing some rewiring and testing. They volunteered to make the changes. They picked the DP, where we first found the problem. A couple days later they call me into the lab, they were running the DP diagnostic microcode at full speed, without error. After that the engineers all got to work modifying the schematics, there were a few tricky areas because of the way the C bus was buffered on some cards, but in general it went smoothly. The changes were done in about a month. I told circuits to make the simple changes, like added ground plane, but not the ones that would impact the schedule. I met with Erv and Ron. We discussed strategy. We could rework the existing prototype, but then the boards would not really match the final design with the circuit group’s changes. However, if we waited until all the boards were processed by Design Automation department and a new set built we were looking at two months. We needed more time to debug the Console, and software desperately needed more time to refine the microcode. So we decided to rework one of the prototypes, and begin building a new set of boards immediately. The net result of the backplane problem was about six month slip in schedule, coupled with the one month caused by late microcode. The B5900 was now seven months behind schedule. Prototype one was reworked in about a month, and we now had two machines available for testing. Testing proceeded rapidly, some additional problems were found in the prototype and these were fixed and cycled into the final prototype design. 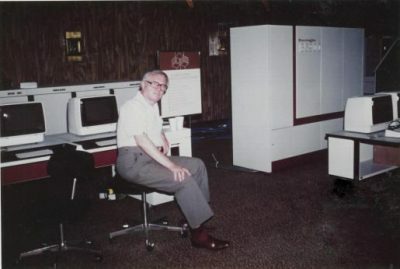 Erv wanted to accelerate the availability of early production units, so he authorized the build of five sets of cards, plus another mainframe to replace the breadboard. We met with manufacturing, which had already got the orders for the 30 Midland units. Now several areas of the corporation had learned of the B5900 and wanted them for testing, demonstration, software development, and to replace older medium system doing payroll and other plant functions. The total backlog reached over 100 machines in just a few weeks, so manufacturing decided to start five units of their own. I had several meetings with the manufacturing engineers; the B5900 was different than the machines they were used to building. First, it was smaller. They used a drag line/cabinet assembly method for the bigger machines. For the B5900 that was not really needed and was not as effective. We developed a build in place methodology, which would be the standard for future machines because technology continued to shrink computers. The B6800 and B6900 used small circuit boards, so it was easy to fix bad boards by hand debugging. This was not the case for the B5900, with its large boards and LSI technology. Also, the B5900 would be the first machine in the field to use board replacement as a repair strategy. On earlier machines, the field tech would run tests which would identify the failed component. The field tech would fix the board right on site, using IC’s, wire, and a soldering iron. The B5900 boards were too large, with very fine traces and a lot of varied components. Since there were only 14 boards, I proposed that each field service organization be shipped one spare set of boards (more later as they got more B5900’s in their territory), the diagnostic would identify the failed board, the field technician would simply swap the board and send it back to the factory. My analysis showed that it was less expensive to the corporation to do board replacement then to do component replacement on the B5900. But the factory had to turn around boards quickly. To do so a special bed of nails tester had to be purchased and debugged. With the tester faults could be found in seconds. I worked with manufacturing to create this fast turn around depot repair facility. About three months later we got the new prototype boards, along with the third mainframe. My engineers began installing and testing them. They worked like a charm. The backplane problem was solved, we tested clock margin and the machine had almost 15% margin, almost unheard of in those days. We also received two more Display Terminal consoles, now fully packaged in a cabinet with integrated floppy disks. After we got the two prototypes running it was time to decommission the breadboard. That was a sad day. Even though it was ugly, it worked, and was where most of the debugging of this brand new design was done. At that time we still had the small lab, but software engineering was clamoring for more space. They also wanted more B5900’s. The B6900 debug was done, so it was decided to move out older machines (there was still a B6700 and B6800) in the lab, and put in two more B5900’s. After only a couple of weeks more of testing we declared the design final. There was still a lot of documentation to complete, schematics to review, specs to sign off on, but the machine was now ready to go to production. It was December, 1980.